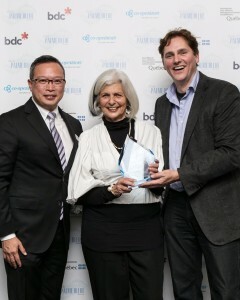 La Chambre de Commerce Francophone de Vancouver | CONGRATULATIONS TO THE WINNERS OF THE PALME BLEUE SMALL BUSINESS AWARDS 2016 ! 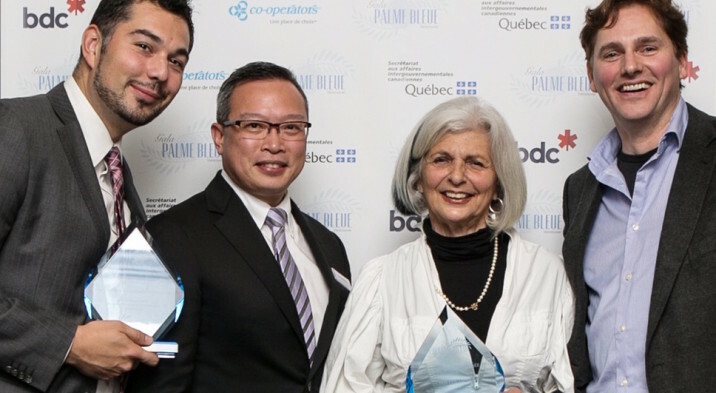 CONGRATULATIONS TO THE PALME BLEUE SMALL BUSINESS AWARDS 2016 ! 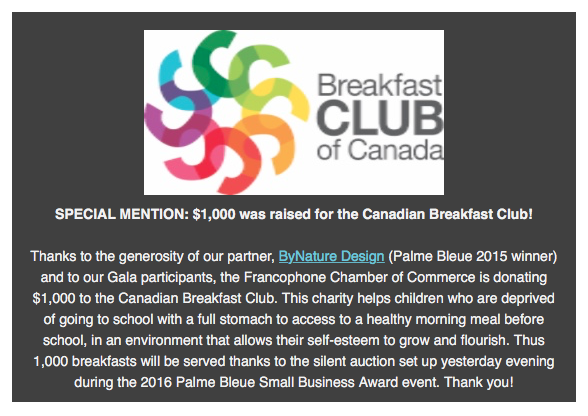 Vancouver, October 13, 2016 – For the fourth year, the Vancouver Francophone Chamber of Commerce has hosted the Palme Bleue Small Business Awards on October 13, 2016, at the University Golf Club in Vancouver. The event was sold out 2 weeks before the Gala with more than 140 entrepreneurs and business people from the GVA. Hosted during the Small Business Month, this event is a competition that recognizes the entrepreneurial excellence and the achievements of the French speaking SME’s in two categories: Business of the Year (3 employees +) and Micro-Enterprise of the Year. This contest is also the opportunity to celebrate and showcase the important contributions of the French speaking business community to local communities and the Province of B.C. This morning, our winners were already on air with CBC-Radio-Canada to share their experience with the audience. 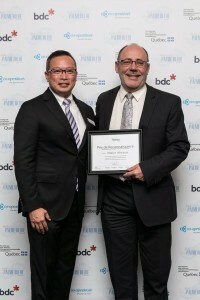 The board of the Francophone Chamber of Commerce has rewarded one of their members, Mr Didier Hovasse, an independent RBC insurance agent, to highlight and thank him for its unconditional suport and comittment towards the Chamber. For more information, please click here. 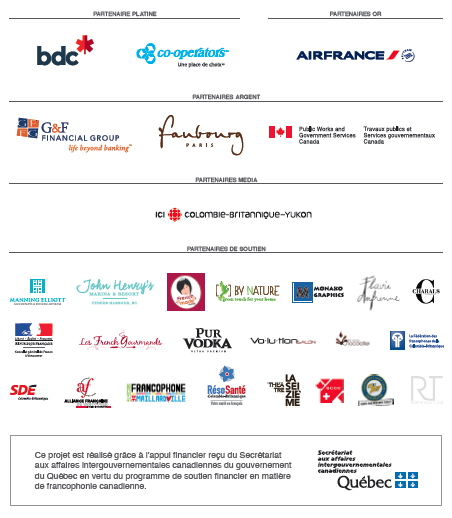 The Francophone Chamber of Commerce of Vancouver thanks all its partners for their support and encouragement to the Francophone entrepreneurship in the Greater Vancouver area. Support that enables us every year to highlight the success and the economic contribution of our Francophone SMEs and business owners to the province of B.C. 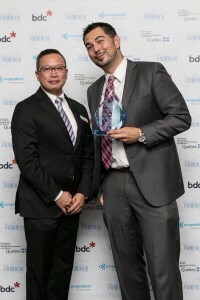 The Vancouver Francophone Chamber of Commerce is a fast-growing, not-for-profit organization, with over a hundred active members. Its mandate is to support and regroup the french speaking business community from the greater Vancouver area, in order to facilitate the growth and economic impact of its members. We count among our members the French Consulate in Vancouver, the Vancouver Board of Trade, the Swiss Canadian Chamber of Commerce and francophone and francophile SME owners. For the past 30 years, the Chamber has been helping and supporting the Vancouver entrepreneurs and business owners, by organizing business networking events, conferences and trainings to meet small businesses’ specific needs. Every year, our events attract more than 500 entrepreneurs and business owners from our region. the Province of British Columbia counts 70,000 francophones and about 230,000 francophiles, a total of 300,000 french speaking people, and 35,000 children enrolled in French immersion programs (Census 2006). the online community of the Chamber represents more than 2,200 contacts and can reach up to 6,000 french speaking people thanks to its partners and allies such as the Swiss Canada Chamber of Commerce, the BC Francophone Federation, the Economic Development Society, the French Consulate in Vancouver….